Liqui Moly Ceratec Long Term Review: This sh*t really works!!!! Finally after having Liqui Moly’s Ceratec added in my Silvia S13 on 6th May 2011 , one year and 9 days later , I had decided to do an oil change!! Though not being a daily driver , this S13 had clocked over 4,000 km of hard driving since the Ceratec additive was poured in .This includes, 2 track days in Sepang, 5 drift sessions , 1 drift competition and 3 autocross/gymkhana events and of course the commute through and fro to the events! In all honesty, this is not the norm as I usually schedule my oil change based on number of events, which is 2 events for my competition cars or on every 6th month for those road cars that is hardly driven. Despite the abuse the lubricant had gone through, there weren’t any noticible drop of the oil’s preformance which I base it on; oil tempreture, smoothness of engine during acceleration and quietness of the engine at idling. So we got the car up the hoist and proceeded to drain the oil. Though expected , it was still shocking to see the oil that came out looked almost like black paint!! Amusingly ,this caused a fair bit of commotion among the people at the shop. Anyway, with the engine oil drained, the oil filter was replaced , a fresh can of synthetic engine oil was poured in and I was good to go. Ceratec is said to be able to last for at least 4 oil changes once the additive had bonded with the internal engine components. So I was eager to see if there were any noticable differences and proceeded to test the car on the way back home. The first thing I looked at was the oil temperature ; The oil temperature readings remained similar to the water temperature and were just a couple of degrees higher than than water after pushing the car a fair bit! This is one characteristic which I found unique when using Ceratec as I usually run on a higher oil tempreture as compared to water. I did not detect any changes of smoothness of engine and the car idled the same as before the oil change. Please with the result , I headed home and planned to use the car again for an up coming autocross event the following weekend, unknowingly which turned out to be the real test for the Ceratec Oil additive! On that weekend ,I took a slow drive to the location of the event and while warming up the car prior to my run, I had decided to adjust my shift light and proceeded to rev the engine to set the limit. A saw a puff of smoke coming out of the engine bay when I lifted off the throttle and thought that the car had suddenly develop a bit of blow by from the idling it had done and didn’t pay much attention to it.With the air condition on and stereo playing, I begin heard loud rattling noises . As there were a few cars around me, all warming up their engines prior to their runs, I had thought that it must have came from one of the other cars. Yes..I’m an idiot…anyway a least 2 minutes had passed when suddenly I saw Jane running up to me ,telling me to kill the engine!! It was then I had realised that the noise had actually came from my car. Popping the hood , revealed that the oil filter had came undone causing the engine oil to splash out out all over the engine. What caused this is another story all together but I was truly devastated at the thought of an expensive engine rebuild , as posted on my page. I checked the dip stick and there weren’t a single drop of oil in the engine. Basically I had the car idling on an empty sump!! Things really looked bleak as I waited for what felt like an eternity for my mechanic to arrive. Eventually he did and had the the oil filter fitted back , poured some synthetic engine oil back into the engine and proceeded to start the engine. To my relief , the engine run fine. There weren’t any audible bearing noises which attributed to engine bearing damage and the rattling noise I had heard earlier were the oil starved hydraulic tappets which functioned fine once the engine was filled with oil! This entry was posted in Liqui Moly, Posting by Ariff and tagged Ceratec friction test, Liqui Moly Ceratec test on June 27, 2012 by skagee. Most of you guys were wondering; what had happened to me during the Malaysian leg of the Formula Drift Asia. I didn’t compete nor did I turn up for any of the three days it was held on. My sponsorship for the event did not go through making me unable to join. I was disappointed as this is the first time I have not competed in this prestigious drift event.As the reason for me not making my appearance to the event ;Drifting is a great spectators sport but I make a lousy spectator so instead I had spent time preparing my car and joined the Conemasters series held in conjunction with ZTH’s Time to Attack event. I arrived at Sepang, bright and a bit too early that day as the organisers were still in the process of setting up the course . Further more I was the only competitor there as no one had arrived yet.. However ,the organiser , Ben Lo being the kind soul he was , took the trouble to entertain me and also brought me around the course while I waited for the rest to arrive. 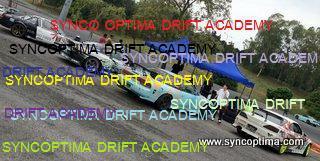 Soon the participants slowly made their appearance and we were then allowed to go out on our practice laps. Conemasters have a different way of running their events where participants have an unlimited amount of practice runs within the given time as compared to single practice runs by other organisers. Our timed runs also worked the same, where we are divided into our respective categories and were given unlimited runs within the time to each category.This gave the participants ample time to experiment and improve on our runs ! However, it was all business when it was time to compete. Most notably were the AWD category where we see their times going down after each successive run! The cool thing I like about autocrosser are they are always willing to share and help other competitors, two of the participants who help me the most were also my competitors fighting in the same category, Hafiz and Mickey which ended up sharing the podium with me!! It goes without saying that I really did enjoy myself and was pleasantly surprised when I clocked the fastest time in the Rear Wheel Drive Category and 2nd fastest overall. And the icing on the cake was the swag I had gotten for being champion; A car stereo player from Clarion, Shoes from DC, Motor Oil from Martini racing and vouchers and coupons from other sponsors!! Many thanks to Ben lo and the crew of Conemasters!! This entry was posted in AutoCross, Autokhana, Posting by Ariff and tagged Ben lo, Conemaster International Gymkhana Challenge, Conemasters, Gymkhana Malaysia, Sepang Gymkhana on June 2, 2012 by skagee.